The Pegomastax (peg-o-mas-taks) is one of the Creatures in ARK: Survival Evolved. Contrary to the dossier, the Pegomastax is a relatively aggressive animal, attacking survivors on sight. 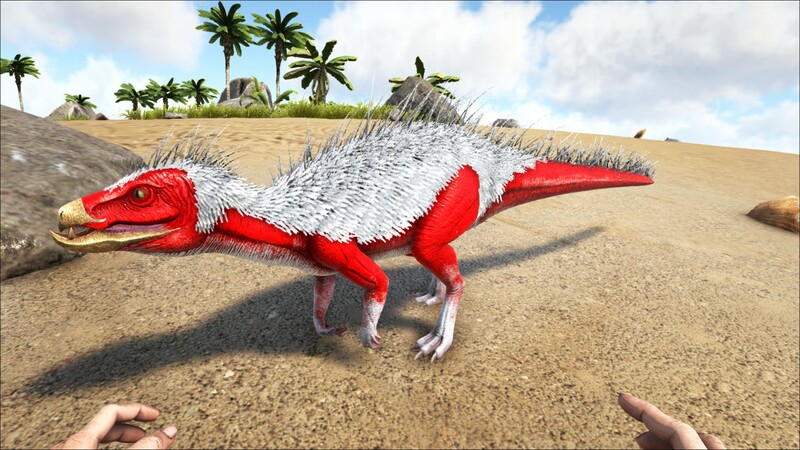 However while its damage is very minimal, the Pegomastax can steal items from a player's inventory; aiming primarily for the items in your last inventory section. If the last inventory section is empty, it will try to steal from other inventory sections. Once tamed, the Pegomastax is a friendly creature that will ride on the player's shoulder. The Pegomastax is a small herbivorous biped with several avian features. First is its beak, which grants the creature a strong bite to crush nuts and fruits. The beak also has small boar-like tusks in it, serving as a tool for harming attackers, humans or dinosaurs. Second is the feathers that cover its back. Unlike those of birds, they are stiff and stand straight like porcupine's quills, though nowhere near as dangerous. This section displays the Pegomastax's natural colors and regions. For demonstration, the regions below are colored red over an albino Pegomastax. The colored squares shown underneath each region's description are the colors that the Pegomastax will randomly spawn with to provide an overall range of its natural color scheme. Hover your cursor over a color to display its name and ID. 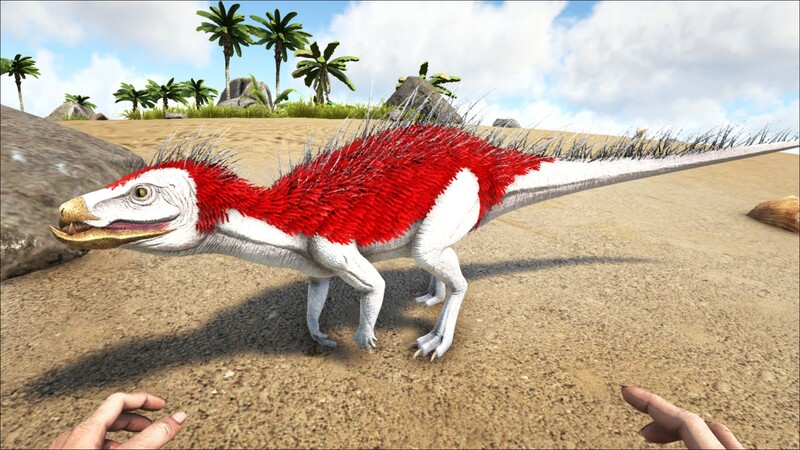 For example, "cheat SetTargetDinoColor 0 6" would color the Pegomastax's "main body" magenta. The Pegomastax steals a random item from a survivor's inventory. If wild, the Pegomastax must either be killed, tranquilized, or tamed in order to retrieve the stolen item. If tamed, pickpocket settings can be toggled in the radial creature menu. The Pegomastax has a unique variation to the Passive Taming mechanic - rather than pressing E to feed an item to the creature, you must allow it to Pickpocket the item from you. This deals a minor amount of damage, after which the Pego will run away and there is a delay before it can be "fed" again. It will prioritise the item held in your last inventory slot, but will move on to steal other random items if your last inventory slot is empty - food items stolen from other slots or your inventory will still count toward the tame. If you have no items - it will become conventionally aggressive. Note that Pickpocketing will steal the entire stack, not just an individual item. Items that the Pegomastax steals can only be reprised from its corpse or its inventory (tamed or knocked out), with the exception of valid taming foods (i.e. those listed in the table below as well as all types of Kibble) that will be lost. The amount of consumables in a stack appears to improve taming time, but this is not a 1:1 ratio with the below table (Tested: A level 25 took 4 stacks of 100 mejoberries to tame). Taming Effectiveness is always 100% (i.e. +50% bonus levels) unless damaged, although damaging a passive tame will reset all Taming Affinity (Progress). Put mejoberries in stacks of 20 in your inventory, only carry berries let him steal a stack at a time, he will lose a little taming before returning to steal again, a small 1 x 1 box works well to keep him from running away too far after stealing each time. If you encounter problems with dropping tame despite continued stealing, try a larger box and giving the Pegomastax more room. In rare cases a Pegomastax is also tamed directly when hitting them with the primary attack of a dino the first time a Pegomastax attacks. This section describes how to fight against the Pegomastax. Pegomastax will attack you on sight and once within range will attempt to rob you of a random item! Chase down and stab, shoot, set on fire, or even eat the poor creature to reclaim what it stole! The only real danger from this tiny monster is that it may rob you of a critical item while you are in combat. 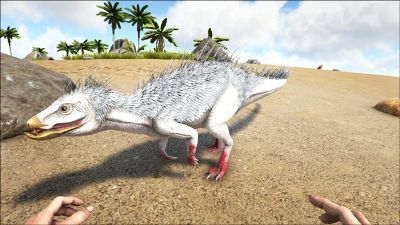 Pegomastax have low health pools and are fast but not faster than most players. There is a way to prevent, or at least lower, the risks for a pegomastax stealing an important item from your inventory. It is unknown if it is a bug or if it is intentional because of taming techniques, but a pegomastax will almost certainly steal the item that is in the rightmost slot of your action bar. That is if there is an item in that slot and you are not holding something in your hands. A simple trick is to bring something somewhat useless and easily stackable that you would not care if the pegomastax steals it or not, such as spoiled meat. Bring a stack of spoiled meat with you and split it into smaller stacks in your inventory. The more stacks of spoiled meat there are, the more likely the pegomastax will steal one of those instead of your other stuff. After that, all you have to do is some inventory management to make sure all those stacks of spoiled meat don't annoy you when you want to take something in your inventory. To even lower the chances of a pegomastax stealing your important stuff, be sure to put one of those small stacks of spoiled meat in the rightmost slot of your action bar. Like mentioned above, the pegomastax will almost certainly steal the item in that slot instead of stealing something else. Pegomastaxes seem to have a "hierarchy" of pickpocketing. First, they will steal what is in your hands. If you are not holding anything, they will steal what is in the rightmost slot of your action bar. Finally, if there is nothing in that slot, they will steal a random thing from your inventory. So it is recommended to put some spoiled meat in that slot so that a stalky pegomastax would steal it, thinking it just stole something important for you, while actually you don't care at all about it. After a pegomastax stole it, just open your inventory and put another one in that slot. If another pegomastax comes by or if the same returns to steal something else, it will steal the newly placed stack of spoiled meat. Thief: It steals items from players then attempts to run from them (there is also a chance of it taming). Pet: Like the Dimorphodon and the Compy, the Pegomastax can ride on its owner's shoulder. Some survivors tame it merely for an unusual looking pet. Backpack: It can't carry much, but the Pegomastax can be used to hold smaller items to lighten the load when on a player's back. 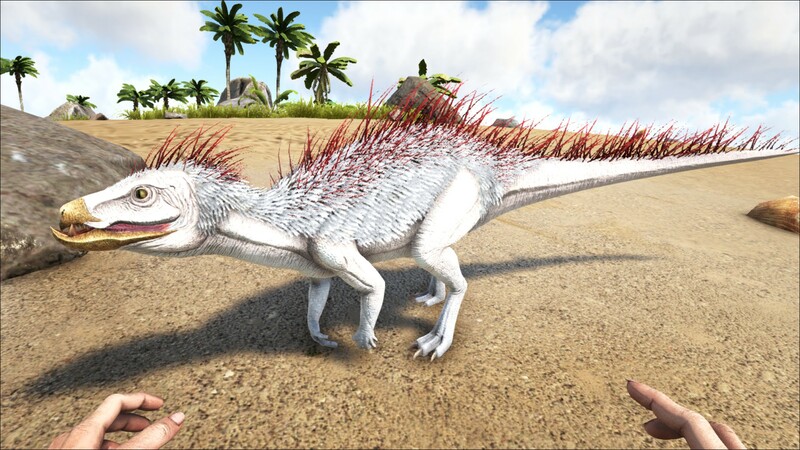 Seed Gatherer: the Pegomastax can be thrown at berry bushes to collect random seeds for farming. The Pegomastax steals things from another player's inventory. What it steals depends on what is carried by the survivor, particularly in their inventory slots. This can prove useful; for example acquiring a higher grade weapon perhaps to turn the tide on an enemy. These creatures are quite adept at stealing from players and can even take items from players' inventories while those players are mounted on dinosaurs. Great care should be taken to constantly replenish the quick item slot after being robbed as these creatures are common in groups and another is usually lurking around. Although the Dossier mentions that the temperament is Defensive this statement could not be more false. The Pegomastax is extremely aggressive and will attack the player and nearly any tamed creature, even the Rex, without hesitation. It may be important to keep some creatures on neutral to protect passive dinos in your base, just in case a Pegomastax slips in and starts attacking. Pegomastaxes can be very threatening to the player as it can steal many valuable things like Element. If it gets stolen, make sure you don’t lose it or you may lose these valuable items. ↑ Jat (18, September 2015). "Introducing the Pegomastax". Announcements. ARK: Survival Evolved Steam Community. Retrieved 18 September 2015.